In the final week of the 2012 presidential campaign, Barack Obama enjoyed his most positive run of news coverage in months, according to a new study by the Pew Research Center’s Project for Excellence in Journalism. Only during the week of his nominating convention was the treatment in the press more favorable. Much of that surge in positive coverage, the data suggest, was tied to Obama’s strategic position, including improving opinion polls and electoral math, rather than directly to positive assessments of Obama’s response to Superstorm Sandy. The storm, however, appeared to reduce the amount of attention focused on Mitt Romney and may well have influenced public attitudes about the president. During this final week, from October 29 to November 5, positive stories about Obama (29%) outnumbered negative ones (19%) by 10 points. A week earlier, negative coverage of Obama had exceeded positive by 13 points. The final week of the campaign marked only the second time in which positive stories about Obama outnumbered negative dating back to late August. 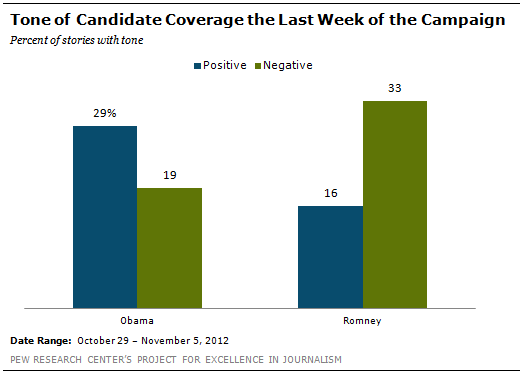 For Mitt Romney in the final week, the tone of coverage remained largely unchanged from the previous two weeks. Negative stories in the press outnumbered positive ones 33% to 16%. But Romney may have suffered in final days from the press focusing less on him relative to his opponent. After receiving roughly identical levels of coverage for most of October, in the last week of campaigning Obama was a significant presence in eight out of 10 campaign stories compared with six in 10 for Romney-one of the biggest disparities in any week after Labor Day. The changes seen in mainstream coverage did not carry through to social media, however, and each of the three major social media platforms offered a different sense of the candidates. On Twitter, for example, the conversation about Romney in the last week was the most positive of any during the general election while Obama’s was basically unchanged. On blogs, it was Obama who saw a surge in favorable conversation. On Facebook, the tenor changed relatively little in the final days. The study tracked the coverage in mainstream news and the conversation in social media in the final two weeks of the campaign (October 22 to November 5) and is a follow-up report to one released by PEJ on November 2 that went to the eve of the third debate. When it came to mainstream news coverage, a leading cause of Obama’s more upbeat narrative in the last week was that the horse-race coverage about his campaign-stories focused on strategy, polls and the question of who is winning-became more positive: 37% were clearly favorable in tone while 16% were unfavorable. That is considerably more upbeat than it had been for most of the final two months of the campaign. The positive final week for Obama stands in contrast to the narrative for both candidates during most of the fall. But it also meant that when the campaign coverage for the two candidates is measured in full-from the conventions to election eve-Obama fared better. All totaled, in the period from August 27-November 5, the number of unfavorable stories exceeded favorable one for both men in the mainstream media, but the tone for Obama was considerably less harsh. In the end, 20% of stories during the fall period about Obama were favorable compared with 29% that were unfavorable (a gap of 9 points). For Romney, 15% of stories during this full period were favorable while 37% were unfavorable, a gap more than twice as large as Obama’s. Obama received no clear bounce in media coverage from the third debate. In the four days after the October 22 debate, which focused on foreign policy, 15% of Obama’s coverage was positive while 28% was negative. That is similar to the previous week, which followed the second debate. Romney’s coverage during those same four days was also largely unchanged from the week before, 21% positive and 34% negative. Hurricane Sandy dominated the news, but not campaign coverage. In the election’s final week, only 4% of the campaign-related coverage was about the storm. And of those few campaign stories that focused on the hurricane, the treatment of Obama was mostly neutral or mixed. However, coverage of the storm may have had a more indirect benefit for Obama by depicting him in passing references responding to the disaster. While the president was not a major figure in these stories, they have may have influenced public attitudes about him. In the final week of the campaign, both Fox News and MSNBC became even more extreme in how they differed from the rest of the press in coverage of the two candidates. On Fox News, the amount of negative coverage of Obama increased-from 47% in the first four weeks of October to 56% the final week. Meanwhile, positive discussion of Romney grew, from 34% of segments to 42%. On MSNBC, the positive coverage of Obama increased from 33% during most of October to 51% during the last week, while Romney’s negative coverage increased from 57% to 68%. The conversation on the three social media platforms studied moved in different directions during the final week of the campaign. On Twitter, Romney had his best stretch of the general election in the final week; 32% of the conversation was positive compared to 45% negative. On blogs, however, it was Obama who had his best week of the entire period studied; positive posts were roughly equal to negative (28% positive to 27% negative). The tenor of the Facebook conversation changed relatively little-the conversation about Obama stayed steady and Romney’s declined a small amount. On Election Day, the differences between the three social media platforms emerged again as each served a different purpose. Twitter was the most instantaneous; 53% of the conversation involved users sharing breaking news or personal opinions. On Facebook, half (50%) the conversation involved personal political expressions. Blogs were more focused on the meaning of the election results, where 47% of the discussion involved post-mortem insights or the relaying of stories regarding broader themes. 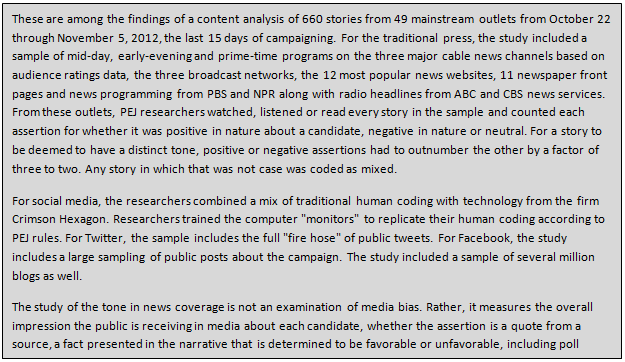 In this study, campaign stories are defined as stories where 50% or more of the story was devoted to discussion of the ongoing presidential campaign, or else included President Obama, Governor Romney, Vice President Biden or Congressman Paul Ryan in at least 25%. Unless otherwise noted, the “final week” in this report refers to the last eight days (October 29 to November 5) prior to Election Day. All other weeks mentioned are from Monday through Sunday.